Eukanuba Veterinary Diets Dermatosis FP for Dogs Dry Food is a dietetic complete pet food for dogs, intended as a support of skin function in case of dermatosis and excessive loss of hair and for the reduction of ingredient and nutrient intolerances. 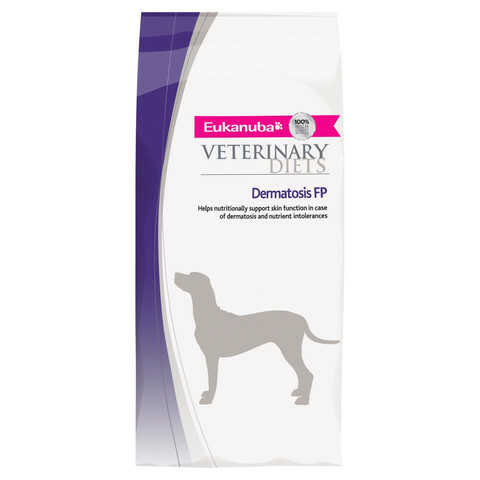 Eukanuba Veterinary Diets Dermatosis FP contains a selected protein source and carbohydrate source and a high level of essential fatty acids. Adjusted ratio of omega fatty acids nutritionally helps to reduce inflammatory mediators in skin. Contains a natural fibre blend, including beet pulp and the prebiotics FOS. Protein (22.0%), Fat Content (15.0%), Omega-6 Fatty Acids (1.70%), Omega-3 Fatty Acids (0.60%), Crude Ash (8.00%), Crude Fibres	(1.80%), Moisture (8.00%), Calcium (1.15%), Phosphorus (0.85%), Vitamin A 12500IU/kg, Vitamin D3 900IU/kg, Vitamin E (a-Tocopherol) 200mg/kg, Iron (Ferrous Sulphate), Heptahydrate 273mg/kg, Zinc (Zinc Oxide)	228mg/kg, Manganese (Manganous Oxide) 30mg/kg, Manganese (Manganous Sulphate) Monohydrate 22mg/kg, Copper (Cupric Sulphate) Pentahydrate 17mg/kg, Iodine (Potassium Iodide) 3mg/kg, Cobalt (Basic Cobaltous Carbonate) Monohydrate 0.6mg/kg.